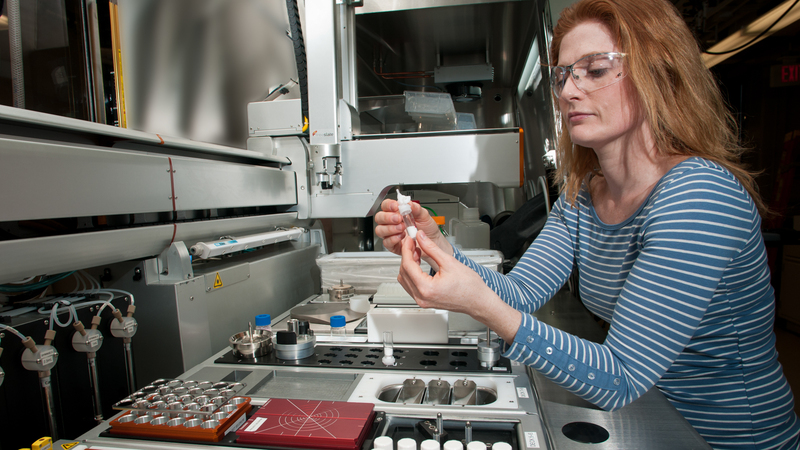 The Electrocatalysis Consortium (ElectroCat) is using national lab resources and capabilities such as Argonne National Lab's High-Throughput Research facility (pictured) and Los Alamos National Lab's multiscale modeling techniques to develop catalysts and test their performance in fuel cells, speeding the process of discovery. Researchers at the U.S. Department of Energy’s (DOE) Argonne and Los Alamos national laboratories have teamed up to support a DOE initiative through the creation of the Electrocatalysis Consortium (ElectroCat), a collaboration devoted to finding an effective but cheaper alternative to platinum in hydrogen fuel cells. Announced earlier this week, ElectroCat is dedicated to finding new ways to replace rare and costly platinum group metals in fuel cell cathodes with more accessible and inexpensive substitutes — such as materials based on the earth-abundant metals iron and cobalt. The heart of the automotive fuel-cell power system is the fuel cell stack, which is where the platinum is used. ​“Platinum is a precious metal, which means that it is both expensive and difficult to get,” said Piotr Zelenay, a Los Alamos National Laboratory fellow and lead scientist on the Los Alamos component of the consortium. About half of the total cost of a typical automotive fuel cell stack comes directly from the cost of the platinum metal in the electrode catalysts. ​“In order to make hydrogen fuel cell cars an affordable reality, we need to find a way to either significantly reduce the amount of platinum needed or completely replace platinum with less expensive materials,” said Debbie Myers, an Argonne senior chemist who will serve as the Argonne lead in the consortium. ElectroCat is one of four consortia that make up DOE’s Energy Materials Network (EMN). The EMN will facilitate industry access to the unique scientific and technical resources available at the national laboratories, enabling manufacturers to bring advanced materials to market more quickly. The partnership between Argonne and Los Alamos that forms the core of ElectroCat involves the study, creation and implementation of possible alternatives to platinum-based electrodes through material-development efforts headed by Los Alamos and accelerated by the high-throughput, combinatorial, characterization and electrode performance modeling capabilities at Argonne, as well as by applying a high-performance supercomputer to model new catalyst structures at Los Alamos. In developing new materials to be explored, researchers at Los Alamos will bring to bear 15 years of experience in platinum-free catalyst design, synthesis, characterization and testing. In addition, Los Alamos can apply multiscale modeling techniques that leverage world-class computing facilities to design catalysts with optimal activity, selectivity and durability. Once the potential replacement candidate materials are identified, scientists in the consortium can examine materials using a number of different methods, including X-ray imaging and spectroscopy techniques at Argonne. Argonne researchers can also investigate samples in a number of different environments that replicate how they would function in real-world scenarios. By combining the expertise and capabilities at Argonne and Los Alamos, in partnership with the private sector and universities, researchers expect to accelerate the development and implementation of platinum-free catalysts in fuel cells.